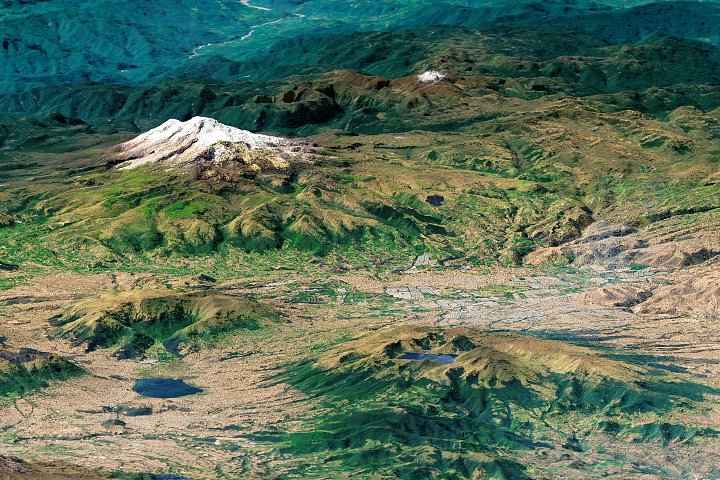 In the Papua province of Indonesia on the island of New Guinea, rugged mountains compose the Sudirman Range. 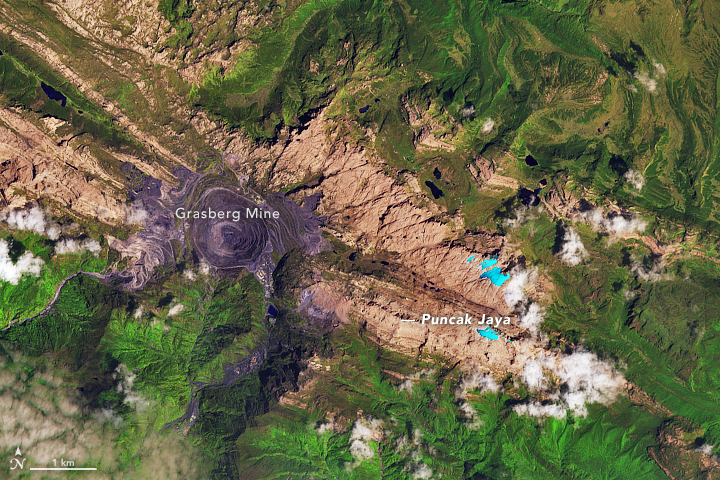 The tallest peak in this range—Puncak Jaya—rises 4,884 meters (16,020 feet) above sea level. An adjacent peak on the rocky ridge, Ngga Pulu, reaches almost as high at 4,862 meters (15,950 feet). Though the mountains are located just south of the equator, their elevation is high enough and the air temperatures are cold enough to still support a few small areas of “permanent” ice. The icefields around Puncak Jaya are rare. You won’t find glacial ice for another 4,500 kilometers (2,800 miles) to the north on Japan’s Mount Tate, which lies outside the tropics where glacial ice is more common. Within the tropics, the closest glacial ice can be found 11,200 kilometers (6,900 miles) away on Mount Kenya in Africa. Like tropical glaciers elsewhere in the world, the glaciers on the slopes around Puncak Jaya have been shrinking and scientists estimate they could be gone within about a decade. 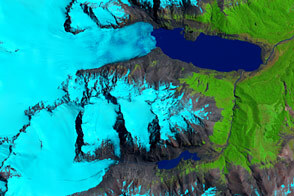 This image pair, acquired in 1988 by the Thematic Mapper on Landsat 5 (top) and in 2017 by the Operational Land Imager (OLI) on the Landsat 8 satellite, shows the ice loss. 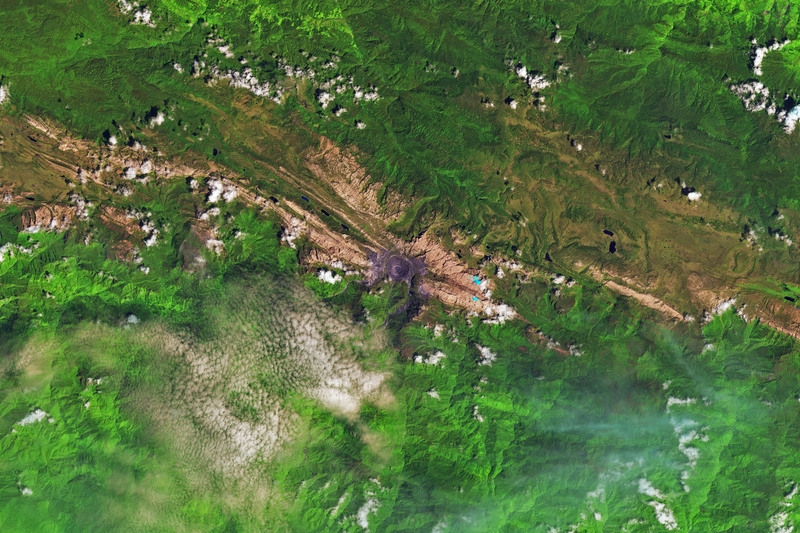 The false-color images are a combination of shortwave infrared, infrared, near infrared, and red light. Ice appears light blue. 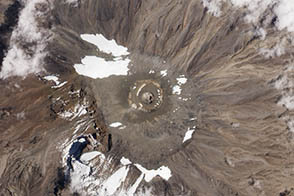 Clouds are white; exposed rock is brown; and vegetation is green. 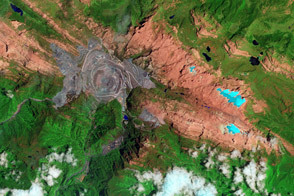 The gray circular area near the center of the 2017 image is the Grasberg mine. 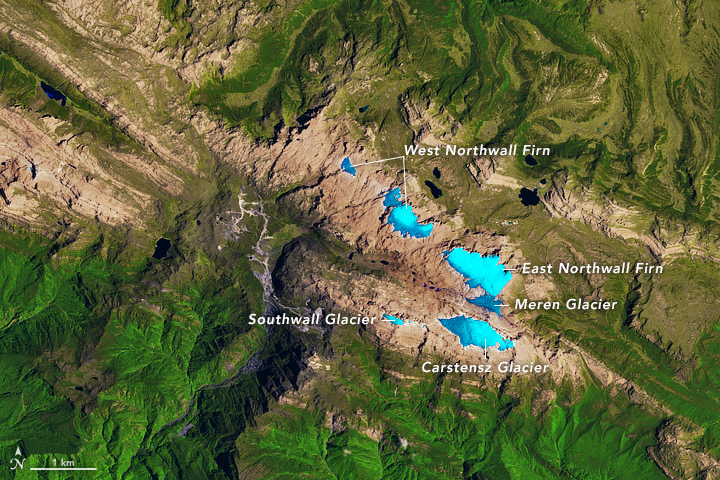 The top image shows that, as of 1988, five masses of ice rested on the mountain slopes. By 2009, the Meren and Southwall glaciers had disappeared, and the Carstensz, East Northwall Firn, and West Northwall Firn had retreated dramatically. By the time OLI acquired the 2017 image, the West Northwall Firn had also disappeared. Turn on the image comparison tool to see the changes. According to Andrew Klein, a geography professor at Texas A & M University who has studied the region, the decline likely started around the 1850s. Aerial photography collected later within a U.S. Geological Survey report provides glimpses of the ice that existed in the area prior to the 1980s. 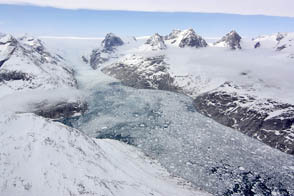 Satellites now allow Klein and other researchers to observe the ice in detail from afar when they cannot get to the remote site. 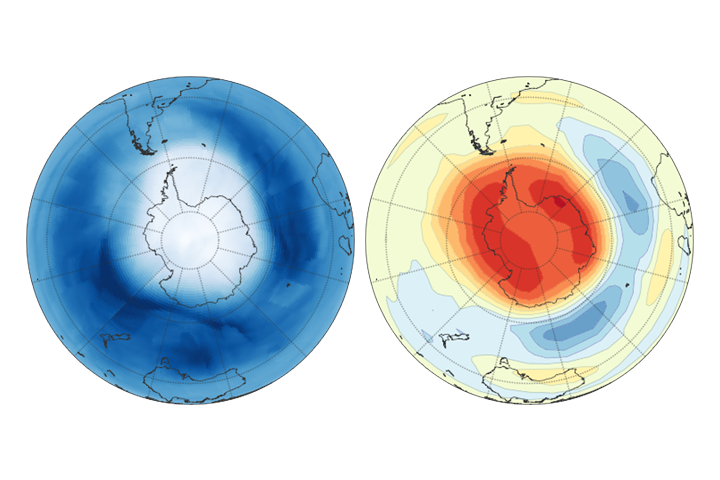 It also allows them to track the rate of ice loss and estimate the timing of its disappearance. Though the mountains are located just south of the equator, their elevation is high enough and the air temperatures are cold enough to still support a few small areas of ice. 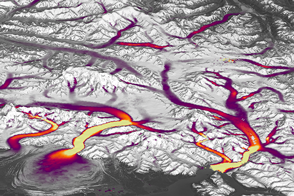 GLIMS: Global Land Ice Measurements From Space (2018) GLIMS Viewer. Accessed February 13, 2018. Landsat Science (2016, December 14) Decline of the Last Glaciers in the Eastern Tropics. Accessed February 13, 2018. 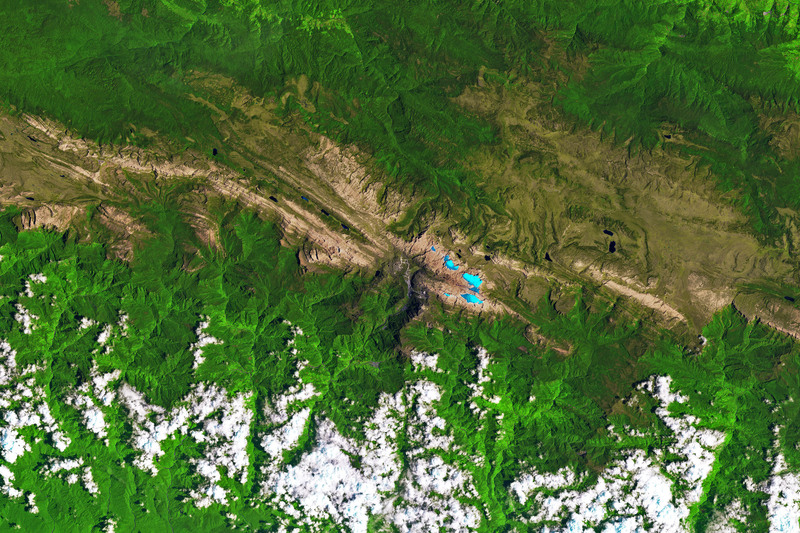 NASA Earth Observatory (2012, September 1) Ice Loss on Puncak Jaya.